For information on The Next Staithes Festival, Please check out this page. This year I have been commissioned by The Staithes Festival Of Arts And Heritage to cover their 2016 event. As part of the commission I have been in Staithes this morning watching some of the artist erect their displays in and around the village. If anyone with a news outlet, local social media groups etc would like some images to utilise in publicity of the event then please feel free to use the images that can be downloaded here. Staithes harbour was today being transformed into an outdoor sculpture park as three major new works were being installed for the Yorkshire fishing village’s annual Arts and Heritage festival this weekend. The local ‘Dinosaur Coast’ is celebrated by two large wire pieces by Emma Stothard. 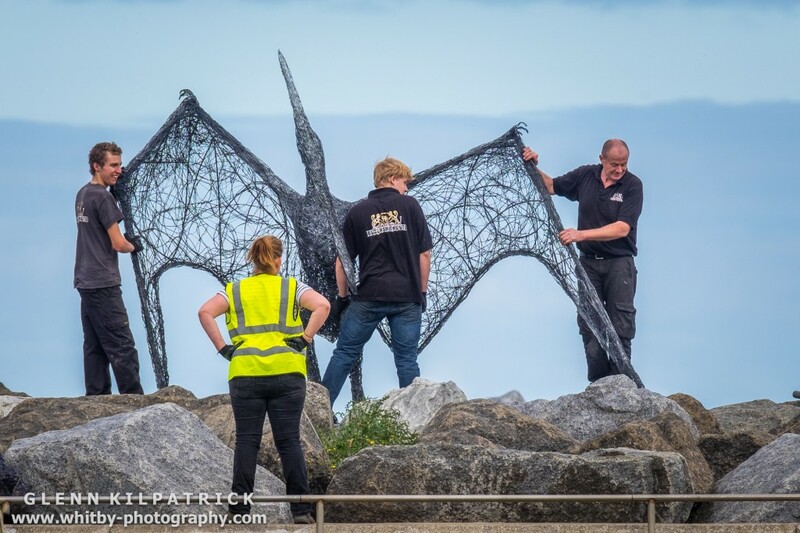 Her ‘Boulby Pterodactyl’ at the harbour entrance recalls a rare pterosaur fossil dating back 225 million years and found in 1887 in the local cliffs at Boulby. Her 20 foot long ‘Plesiosaurus’ matches the size of some of the biggest sea going reptiles ever found on yorkshire’sDinosaur Coast. Emma, from Whitby, is a celebrated sculptor whose work is in international museums and collections including the Prince of Wales’ Highgrove House. 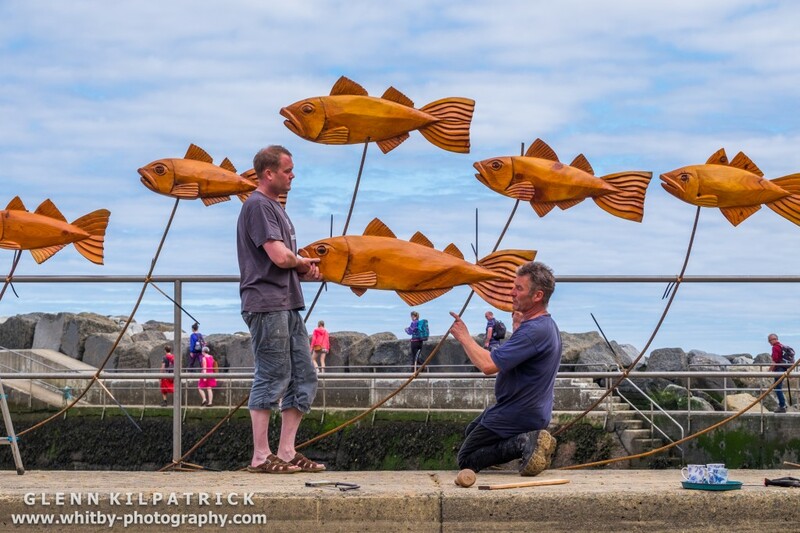 Honouring the village’s fishing traditions is Steve Iredale’s ‘Shoal’, an installation of 32 wooden fish, each up to three feet long, fixed to the harbour’s inner pier. Steve, a Staithes resident, is an acclaimed chainsaw sculptor whose large and dramatic works can be found across Yorkshire including National Parks and Dalby Forest. Read About The 2015 Event Here.